The 2016 Special Olympics Europe Eurasia (SOEE) Football Coordinators’ Meeting took place in Antwerp March 11-12 as part of the long-standing SOEE-UEFA Football Development Project. The Conference was opened by Special Olympics Belgium football athlete Christophe Theys and special guest at the Opening Ceremony dinner was the President of the Royal Belgian Football Association, Mr. François De Keersmaecker. 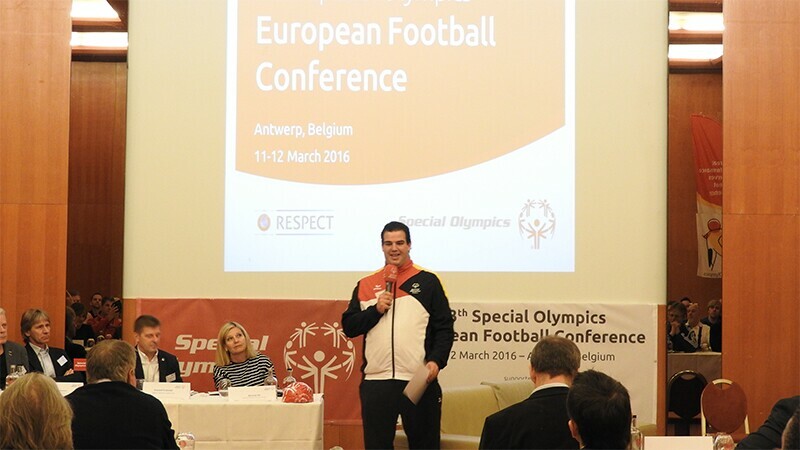 This year’s conference brought together more than 70 leaders from European football including Special Olympics football coordinators, coaches and representatives from key football federations, associations and Special Olympics support staff. Some of the highlights included a panel discussion on the future of 'disability sports at grassroots level' and 'Under-12 football—potential for development.' This discussion produced an interesting debate among it's panelist which comprised of Iris Hugo-Bouvier (UEFA); Kris van der Haegen (Royal Belgian FA); William Gailiard, former UEFA Director and now Special Advisor to ICSS and Marcello Corrado (European Commission). All panelists emphasized that there are no disabilities, only abilities in football and agreed that Unified football (players with and without intellectual disabilities playing together) is the correct path for Special Olympics. Participants explored how football can be used as a platform for the personal development and full acceptance and inclusion of young children with intellectual disabilities in their communities. Under-12 football is a bridge between the Young Athletes Program targeted at children aged 2-7 and regular Special Olympics Unified football programming for those aged 12 years and older. All participants agreed that U12 football is a truly inclusive sport concept which aims to tackle stereotypes and break down barriers in children´s minds through playing the great game of football. Kris van der Haegen presented on how the Royal Belgian FA developed its grassroots football programme. Special thanks to Special Olympics Belgian volunteers and staff for organizing and hosting such a wonderful Conference and to SOEE's Andre Peeters, Mirek Krogulec and Beverly Hill for their planning and hard work.